Two of my greatest joys in life are hiking and trekking, and eating excellent or interesting food. Unfortunately, I didn’t have much of an opportunity to try traditional Greenlandic food during my 5 week visit in 2017. The best I managed was a Musk Ox Sled Dog and some whale at the amazing CaféTuaq in the Katuaq Cultural Center in Nuuk. This definitely caught my interest! The wonderful head chef, Noel, allowed me to come watch the final stages of food prep in the kitchen and ask loads of questions about how the kitchen runs. It is a fascinating enterprise! English is the main language spoken in the kitchen. Given that all the staff are learning or have learned English – they use their working time to also practice and perfect their skills in their third language (both Greenlandic and Danish are official languages in Greenland). The kitchen is extremely busy in the morning as they prepare lunches for over 400 school children at 5 different schools. They can never 100% predict what will be part of the Traditional Greenlandic Buffet, as they source their meat directly from the hunters. It all depends on what has been caught/killed in the past day or two. It was a wonderful experience to learn about the behind-the-scenes at the Hotel Sisimiut kitchen and I couldn’t wait to sample the outcome! Tyson and I were first in the dining room when the food was all laid out for the buffet. The wait-staff went through and explained what everything was, at which point Tyson decided it wasn’t for him and headed off to find something less seafood-y to eat. Which was fair enough. The traditional diet in Greenland draws heavily from the ocean, so if your taste-buds agree with Tyson’s and you aren’t a fan of fish and seafood, you are limited to about a third of the offerings in the Greenlandic buffet. I, on the other hand, decided to tackle this enormous smorgasbord in 2 waves. First up – seafood! Despite my best efforts to get “just a little bit of everything”, my plate still looked very full as I took it back to my table in the Nasaasaaq Restaurant and Brasserie. Before me I had smoked salmon, smoked halibut, Greenlandic prawns, dried cod, dried sardines, baked cod, whale blubber and mattak – a Greenlandic delicacy of whale skin and fat. I’m a big fan of panertut (dried fish), having been introduced to it last year on the Unplugged Wilderness Trek in East Greenland, and both the prawns and the cod baked in a curry-style sauce were delicious. But it was the whale blubber and mattak that I was most curious to try. Read more about seafood in Greenland at A Taste of Greenland. Although most of us balk at even the thought of eating whale, it is an important staple in the Greenlandic diet. Partially this is because a single whale can feed a lot of people for quite a long time, an important consideration when meat is sourced through hunting. But also because it is a very rich source of Vitamin C – something that is critical in an environment where fresh food is scarce. Mattak comes from a narwhal or white whale and is the skin and fat of the animal with a thin layer of cartilage separating them. It is most commonly served cut into small cubes and eaten raw – exactly how it was presented at the Traditional Greenlandic Buffet. Mattak. The skin is the dark part and the fat the white part. The cartilage forms the boundary between the two. It didn’t have a strong flavour but the texture took a little getting used to. While the skin and fat were quite soft, the cartilage was very hard and rubbery, an unusual sensation for me and I felt I had to be a bit careful of how hard I chewed for fear of catching the cartilage at the wrong angle. Nevertheless, I ended up eating two whole glasses of mattak, and happily accepted more when I visited a local Greenlander in their home later in the week. While the epidermis of the whale is a key source of Vitamin C, the blubber is equally important in the Inuit diet. Not only for its calorie content in the freezing Arctic climate, but also because of the large amount of Vitamin D and Omega-3 fatty acids it contains. “The way we usually eat this is with some soy sauce and aromat”, explained the young waitress in perfect English as she pointed out the bottle of Kikkoman’s and a bright yellow powder. While I appreciated the advice, I decided to eat the first piece of raw blubber “as is” to get the pure experience. It didn’t have much flavour, and I found the texture to be very soft and watery, but creamy at the same time. … and immediately went looking for a serviette to spit it back out. The problem was nothing to do with the food. It was the fact that between the first piece and the second piece, I had started to really think about what I was eating, and my mind had had an adverse reaction to the idea of eating blubber. After all, I’m one of those people who usually buys the leanest cuts of meat or trims all the fat off once it is cooked! That left the third piece of blubber on my plate, and I decided it was time to try the soy sauce and aromat suggestion. The locals know what they are doing. With the addition of these two elements, I had no problem getting my last piece of blubber down, though I have to admit it is not something I would choose to eat unless I needed the vitamins! Read more about whale as a food in Greenland at A Taste of Greenland. It couldn’t be a Traditional Greenlandic Buffet without serving the national dish of Greenland – Suaasat. This is a thick soup typically made with seal meat, potatoes, onion, rice, salt and pepper, and perhaps a bay leaf. As one would expect from a dish designed to provide sustenance in frigid Arctic temperatures, it is a rich and hearty soup. It has a very slightly fishy taste, which I assume comes from the dark seal meat, but it was very tasty! Read more about seal as a food in Greenland at A Taste of Greenland. Although the Greenlandic diet relies heavily on what can be caught in the ocean, the world’s largest island also has a handful of decent sized land animals – all of which were on the second plate I helped myself to at the buffet. One of these was very familiar! Lamb is the meat my family ate all the time while I was growing up, and is still a favourite when I go home. Greenlandic lamb is just as delicious as Australian lamb (some experts would claim it is the best in the world!) and frozen lamb chop meals are my staple if I have access to an oven while travelling in Greenland. My go-to meal when trying to eat “cheaply” in Greenland – frozen lamb chops and veggies. This is actually enough for 3 meals for me! The lamb are primarily raised in the south of Greenland and I saw plenty of them as I hiked the area between Narsaq and Narsarsuaq last year. And although the lamb of my plate was wonderfully cooked, I was far more interested to taste the other two meats. Read more about lamb as a food in Greenland at A Taste of Greenland. Although I’d tried a musk-ox hot-dog last year, I was keen to try a less manipulated version of the meat. It turned out that musk-ox was actually my favourite of the 3 meats! The taste was enhanced by careful selection of herbs and was nowhere near as strong as what I’d experienced with the hot-dog. It was perfectly cooked, juicy, and yes – I may have gone back for seconds … and thirds! Read more about musk-ox as a food in Greenland at A Taste of Greenland. The third meat on the plate was reindeer, the favourite of Noel, the head chef. He was telling me while I was in the kitchen that reindeer meat is very lean, so the fat must be left on while cooking to ensure it is as tender as possible. I hope it wasn’t this reindeer we saw along the Arctic Circle Trail that ended up on my plate! Certainly, it was not as tender as the other two meats, and although it was very mild at first taste, a stronger gamy flavour developed as an after-taste. Read more about reindeer as a food in Greenland at A Taste of Greenland. If you are interested in trying new foods and/or are looking for an unlimited amount of food for a great price in Sisimiut, you must try to time your visit to coincide with the Hotel Sisimiut’s Traditional Greenlandic Buffet. Time: as long as you want to keep eating. I took about 2 hours before I couldn’t fit anything else in. After 2 years of this blog, my friends joke that if I’m not posting about hikes or treks I’ve done, I’m posting about food. So they won’t be surprised that one of the very first things I did when planning my trip to Iceland was look up foodie tours 🙂 Specifically, I was looking for an opportunity to try some of the more unusual Icelandic foods, which is how I chose the Reykjavik Food Lovers Tour – Icelandic Traditional Food by Your Friend in Reykjavik. We were met at Ingolfstorg Square by our guide, Fanney, and walked less than a block to our first foodie stop. No, I’m not going to tell you where – you need to actually do the tour to find out 😉 Suffice to say that the restaurant is one of the older houses in Iceland and was originally used for falconry! Here we tried one of the things I was most excited about – hot smoked Icelandic puffin. Yes, those cute little birds with the bright orange beaks. Our next stop was again only a block or so away at one of the oldest restaurants in Reykjavik (founded in 1932). Here we tucked into a too-large-for-a-foodie-tour bowl of Icelandic lamb soup with its melt-in-the-mouth lamb, tender carrots, celery, potatoes, onions and loads of rich lamb flavour. Although I’m a seasoned foodie tour goer and I knew I should be pacing myself – I couldn’t help but finish the whole bowl … and the bread. To make this soup there are special cuts of lamb that should be used as well as a very particular herb mix, but as far as veggies go – well anything that doesn’t go bad too quickly is fair game. Two tastings in and so many more to go… Oh oh – already starting to feel full! Fortunately our next couple of stops involved much smaller samples! Icelandic hotdogs are basically an unofficial national dish. Made predominantly out of lamb (theoretically) you should ask for “one with the lot” to enjoy the full experience of fried and raw onion, ketchup, remoulade, and sweet brown mustard (pylsusinnep) along with the dog and steamed bun. Icelandic hot dog from Reykjavik’s best (and oldest) hotdog stand. Yes – they even have hot dog holders on the tables! The hotdog stand we visited on the foodie tour has been around since 1937 and shot to fame in 2004 when Bill Clinton ate there. I’m nowhere near famous, and I don’t usually eat hotdogs, but I have to admit this these ones make for a very tasty snack! You don’t have to be in Iceland long to realise that dried fish (Harðfiskur) is also a staple in the Icelandic diet and a favourite snack for locals. I had eaten a lot of Icelandic dried fish on the Unplugged Wilderness Trek in East Greenland last year and love pairing it with remoulade (mayonnaise is one of the very few things I really don’t like the taste of, but for some reason, I love remoulade!). Every Icelander I’ve suggested this to, including Fanney, has looked at me in bewilderment and admitted they’d never thought to try that. They usually just eat it plain or team it up with butter! Seriously guys – try it. It is amazing! If you mention traditional Icelandic food, those who know something about it will come back with “don’t they eat fermented shark?” Why, yes they do! Or rather, they did (current Icelanders are far more likely to opt for a hot dog) and this is what we were going to try next. Given that Hákarl is an “acquired taste” we were presented with small cubes to sample. I’d actually tried some previously with the Icelandic family with who I was staying, but this time around the ammonia was much stronger (to me it had elements of a REALLY strong brie). I don’t find the taste horrible, in fact I was surprised at how mild it was, but I also wouldn’t rush to order it I have to admit. We actually had 3 plates in this restaurant (!) and next up was lobster (langostine) soup – one of the most popular dishes on the menu. This was really creamy with a slight thai-red-curry flavour and very tasty. However, by far my favourite dish of the whole tour was the third dish we tried – Minke whale with honey mustard dressing. I’d tried whale previously in Greenland and liked it – but this was beyond awesome! Tender, juicy, and with a perfect balance of spices. Oh. My. Goodness. I know some people won’t even entertain the thought of eating whale based on what we hear about whale hunting in the media (actually I’d be surprised if such people were still reading given I opened with eating puffin…), but Minke whales have never been endangered and there is a yearly quota (of less than 0.03% of the stocks around Iceland) that is strictly adhered to. In other words, it is sustainably hunted (as it is in Greenland) and is more “green” than importing beef or chicken from other countries. 3 different types of fish. Awesome chips. 9 different flavours of sauce. What combination to choose?! Beyond stuffed, we still had one last dish to sample on this incredible foodie tour. Fortunately it was dessert, and everybody knows there is a whole separate stomach for dessert … right? We actually ended up back at the very first restaurant we started at for our Skyr dessert and an Icelandic beer. Skyr, cream cheese, biscotti, pistachio and berry jam “Skyr Dessert”. Heaven on a plate! Tasting similar to a cheesecake, this was another of my favourites for the tour. And having eaten mine quicker than the others, I was looking longingly over for scraps … none of which were forthcoming. It was too good! And a perfect way to finish off our trip through modern and more traditional Icelandic fare. Fanney left us each with a chocolate bar that incorporated Icelandic liquorice (oh how I love Icelandic liquorice!) and I eventually managed to bid my fellow foodies adieu and stagger back home with my over-extended but very happy stomach. I absolutely recommend the Reykjavik Food Lovers Tour with Your Friend in Reykjavik. The food is amazing (and very plentiful! ), the stories about the establishments are really interesting, and Fanney had loads of information about Icelandic food preparation and food culture in general. Top Tip: perhaps don’t eat breakfast or lunch beforehand! I really, really like the town of Loja in southern Ecuador! I was fortunate enough to be there for part of the Festival Internacional de Artes Vivas Loja, but aside from this, I also just really enjoyed the vibe of the town itself. I also love that the architecture is very different to what you see in the Historic Centre of Quito or in Cuenca – much less grandiose. These guys have only just started up, and I hope they get the funding they were seeking to grow the business, because these walking tours are always a great way to get acquainted with a place and learn a little about the history in particular. I try to find them everywhere I go. For example, one of the most famous landmarks in Loja is the Independence Monument. But it is just another monument/clock tower (and not terribly interesting) unless someone actually tells you about its history and the stories depicted in the panels around the 4 sides of it. 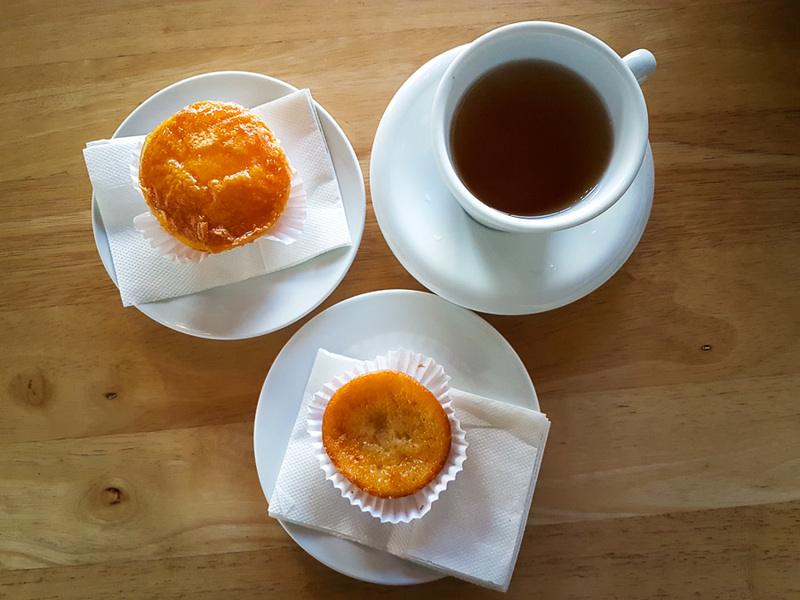 I started off with something that isn’t actually typical to Loja, but that I’d been super-keen to try ever since reading about it on the web – a Bolón de Maní. A bolón is essentially an Ecuadorian dumpling made of green plantains mashed with a variety of other ingredients – in this case – peanut paste (in Ecuador you can buy pure peanut paste [very cheap] as well as peanut butter [very expensive – go figure!]). Mine was bigger than a softball/baseball, and soft and warm with an obvious peanuty flavour. It was served with 2 sauces: chile and coriander, and what tasted like spicy curry. Absolutely delicious and enough for about 3 meals for me – all for USD$3! I do use TripAdvisor as I travel, but find that their restaurant/cafe recommendations are a little hit and miss. Probably because everyone’s taste-buds are different and I’m a bit of a self-admitted food snob. But I decided to head out to try the #2 ranked restaurant in Loja – Mama Lola – which serves traditional Lojano cuisine. I’m sooooo glad I did! I ordered the Cecina, which is a very thin pork steak marinated in cumin and garlic, and one of the most typical dishes of Loja. It usually comes with yuca and other accompaniments, and, in typical Ecuadorian fashion, I was presented with about 3 times as much food as I could possibly eat. Yes – that’s potato bake, salad, pork, corn (top right), popcorn, two different sauces, and you can’t actually see the large chunks of yuca hiding underneath the pork steak. It was very good, but I have to admit that I still prefer the fritada (braised pork) or hornado (slow-roasted pork) that you find in Quito. Despite not being able to finish my meal, I spied the most incredible looking desert over on the next table and I figured I had to try it. It turned out to be an amazingly light and fluffy cheesecake – the best I’ve ever eaten – and I have to admit I almost ordered a second one to take home with me! And can you guess how much my cecina, my cheesecake and a large limonada drink cost me? USD$7.25. Ecuador is a fantastically cheap country for eating. The other “must try” dish from Loja is a thick, hearty soup called Repe. It is made from a base of green bananas, onions, garlic, milk, cheese and coriander, and tends to have lots of “bits” in it. The one I tried at the Mercado Central was the Repe de Arveja con Guineo – or Ecuadorian split pea and green banana soup. And once again, it was cheap as chips (USD$1) and absolutely delicious. Actually, I don’t think I’ve ever had a bad soup in Ecuador. They really know how to do them well! I accompanied this with a typical herbal tea: Horchata Lojana – a warm, very sugary, rose-flavoured drink with spices. It was OK, but I don’t particularly like sugary drinks (despite my sweet tooth), so it was both the first and last time for Horchata. On my way out of the market, I decided to buy a tray of Lojano sweets including Bocadillos Lojanos (small squares of panela and peanuts) and Lojano figs. Not sure what the other ones were, but the bocadillos were definitely the pick of them! And on a last minute whim as I headed for the exit – I decided to try Sábila. I had no idea what it was (the lady I bought it from couldn’t explain it to me) and I had never seen the word anywhere before – so why not! Oh what a big, big mistake! Turns out Sábila is a drink made with Aloe Vera. And although it has almost no flavour, I could not cope at all with the texture of it. The best way I can describe it was that it was like drinking a jellyfish, and every sip I took, the aloe would stick to my lip and trail the glass as I moved it away from my mouth. The 2nd November is “All Souls Day” in the Catholic calendar, the “Day of the Dead” in Mexico, the “Día de los Difuntos” (Day of the Deceased) in Ecuador. I didn’t realise it when making my plans, but Otavalo turns out to be one of the best places in all of Ecuador to experience this important day. The tradition (particularly strong amongst the more indigenous peoples of Ecuador) is for families to visit the cemetery, taking food and drink for a picnic on the grave of the deceased. Yes, you read that correctly, ON the grave of the deceased. The idea is that the souls of the dead visit on this day, and families need to provide plenty of food so that these souls can gain strength to continue on their journey to the after life. I asked at the hostel when the celebrations started, and they advised me that between 11am and 1pm would be the best time to see what was going on. So off I set in the blazing sun to the indigenous cemetery. It was not hard to find – really, you just had to follow the crowds! Lining both sides of both access streets were people selling flowers, wreaths, fruit (especially sweet pepinos), and food. Lots and lots of food – the most popular seemingly being the fish Tilápia, fried, of course. And everywhere you looked, there were women selling the most traditional of treats for this particular occasion – Guaguas de Pan (bread babies). These are sweet breads shaped like babies (guagua or wawa means “baby” in Quechua) that have been wrapped in swaddling (note, they don’t have arms), and decorated with colourful icing. They can be plain or filled with a fruit jam, and in some parts of Ecuador, they can also take the shape of an animal. Food and flowers purchased, the families then entered the cemetery to find the plot of their deceased. And what a spectacle it was! to everybody laying out a picnic on top of the graves. It was incredibly difficult to move and find a place to stand to take it all in. It was just amazing to see such a healthy attitude towards death! After about 2 hours of wandering around, I left with a touch of sunstroke (why I didn’t put my hat on, I don’t know!) but returned at 2:30pm to see how the day had unfolded. Wow! What a difference! There was almost nobody left at the cemetery! 3 hours later and the cemetery was almost deserted! It was a great opportunity though to wander around admiring the freshly-tended graves and marveling at the bootprints that trampled the dirt mounds. I felt really self-conscious walking all over the graves, but it is what everybody did and nobody blinked an eye. I was also surprised at the lack of rubbish left behind in the wake of so many people and so much food! Very a-typical for such a large gathering in general, and for Latin America in particular. From the cemetery I headed back into town for a very late lunch and decided I had to go the full traditional spread. So fried Tilápia, Guaguas de Pan, and Colada Morada – a thick, sweet, drink made with purple (or black) corn, spices and berries. Yum! The Día de los Difuntos really was quite a sight and if you happen to be in Ecuador on November 2, I’d encourage you to definitely experience it. After 2 weeks of hiking in great weather in South Greenland, I arrived to cold, wet and wind in the capital, Nuuk. I was picked up at the airport by my Airbnb host, Rene, and taken to the accommodation. It was absolutely awesome – my own space with a separate entrance, fridge, microwave and bathroom, and only a 5 minute walk to the centre. Heaven for the next 5 days! It was snowing on my second day in Nuuk (yes, in the middle of summer) so I only headed out for lunch. In my quest to try some typical Greenlandic food, I went to the amazing Katuaq Cultural Centre and decided on the Musk-Ox hotdog. Wow! That is a strongly flavoured meat! Seriously, seriously intense flavor, and apparently not just because it was in sausage form … the meat itself is very gamey. The third day dawned bright and clear and so I wandered around the old part of town – which, with its small, brightly painted houses looks a little like a toy town. All the newer areas of Nuuk tend to be apartment buildings – so there is quite a dichotomy of architecture in the capital. The nice thing about some of the older apartment buildings though – they have amazing murals painted on them. Love this! I took a break from hiking (there are two short hikes in the surroundings of the city), but did walk out to a few different viewpoints around town. The view from the point near Café Inuk in particular is absolutely stunning! The image below was taken at 9:30pm. Yes, the sun is still up! And the images below were taken at midnight. Nuuk is just a little south of the Arctic circle so the sun does set briefly (between about 11pm and 2am), but it never gets completely dark in summer. I returned to the café at the Katuaq Cultural Centre to try the “Greenlandic Tapas” on another occasion. In amidst shellfish salad, mussels, prawns, marinated salmon, and another mini musk-ox hotdog (called a “mini hot-dog sled”), I also got to try fried whale meat. The flavor was very unexpected – very, very mild and kind of fishy (yes, I know a whale is a mammal). So, a very lazy time in Nuuk catching up online and hanging out with Andrea, Lars and their friends. Lovely way to spend 5 days though – just chilling out for a while! East Greenland, here I come! If this post has piqued your curiosity about Greenland, learn more about this amazing country at Visit Greenland, and check out the wide range of tours and accommodation available at Guide to Greenland. Yes, I tried it. No, I’m not drunk – the picture is blurry because it was dark inside and an odd angle (that’s my excuse and I’m sticking with it!). No, I still don’t like wine at all ☹ Can’t really say much about the wine given the previous comment – but they tell me it is a semi-sweet red with raspberry notes. No idea what that means, but hey – I had to try it! Traditional bakeries are often found underground, but all you have to do is follow your nose and look for the sign! The Georgians bake a whole array of different bread and bread products, but the traditional bread is incredible – especially when eaten straight out of the “tone”. This is a clay oven where a fire in the bottom heats up the sides and the bread is slapped against the side to bake. The tone is the large white pit the baker is lifting the bread from. It is salty (thanks to the cheese) and I couldn’t eat more than a slice! Adjaruli Khachapuri – yet another heart-attack-on-a-plate! I actually made this one myself at a (I have to admit) not brilliant cooking class I did – only the second time I’ve been disappointed by a cooking class. And, like that previous cooking class, I didn’t particularly like very much what we cooked. Khachapuri Adjaruli is incredibly rich (as you can imagine) and I only managed to get through about half of it. The idea is that you mix the egg and butter through the melted cheese, and then tear off bits of the bread to dip into the eggy-cheesy mixture to eat it. Another bread variation (have I mentioned how many carbs I’ve eaten in the past 6 weeks on this Silk Road trip??!!) – essentially a flatbread stuffed with spiced beans. Incredibly cheap and filling, and a staple Georgian fast food. I’d eaten quite a few Manty as I traveled through the ‘Stans – Khinkali is Georgia’s version of dumplings. The traditional ones are filled with meat and spices (Georgians have a particular love or coriander, much to my delight) with a “soup” trapped in the middle. I hadn’t actually read how to eat these before I tried them, so committed massive faux pas (fortunately nobody was watching) by eating the topknot and eating them with a knife and fork – which meant that the soup was essentially lost. Oh well. A traditional pastry that is full of butter and sugar, as all good pastries are. However, the degree of butter and sugar in this one is particularly special – I only made it half way through before I had to save the other half for the next day! It was incredibly rich! Traveling through Georgia you often see long, brownish or reddish lumpy objects hanging in street vendor stalls and shops. At a first glance, it is not at all obvious what these things are – my guesses were lumpy candles (Georgia is quite a religious country after all) or sausages – but I really wasn’t sure. Turns out – they are something to eat – but definitely not sausages! Walnut halves (in the east of Georgia) or hazelnuts (in the west) are threaded together on a piece of string, and concentrated grape juice thickened with flour and sugar or honey is then poured over the strands. This is left to dry in the sun before another layer of the thickened grape juice is added, and this is repeated several times to build up a coating of chewy goodness. The amazing thing is that they actually aren’t too sweet! Almost always sold by the same people selling Churchkela, Tklapi are essentially enormous fruit Roll-ups made from pureed fruit that has been spread thinly onto a sheet and sun-dried. There are many different flavours on offer, some sweet (kiwifruit, apricot) and some quite tart (for example, made from Tkemali, or sour plums). A fantastic stew made from beef, walnuts, sour Tklapi and Georgian spices (khmeli suneli). Very tasty! Another delicious Georgian stew with tomato and spices, and best served with fresh Georgian bread. Georgia’s traditional chicken soup make with chicken, vinegar, egg and flour. This is a common entrée in Georgia and continues Georgia’s seeming obsession with using walnuts in their food. Essentially long, thin slices of pan-fried eggplant with a paste of walnuts and spices rolled up inside. Not as flavourful as I imagine it would be, but quite good. Unfortunately this is just scraping the top of the barrel of typical Georgian food, and it is all incredibly tasty. Will have to go back to try some more!